This is the first in a series of DUI articles focusing on Macomb County District Courts. 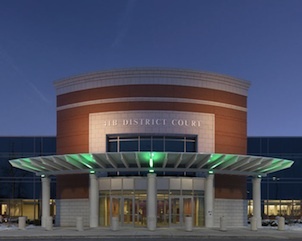 To begin, I think it’s fitting for me to explore my “home” Court, the 41B District Court, which handles cases arising in Clinton Township, Harrison Township, and Mt. Clemens. Housed in a beautiful new building and staffed by 3 Judges, Sebatian Lucido, Linda Davis, and as of Jauary 1, 2011, Carrie Fuca, the 41B District Court is a model of efficiency. For those facing a Drunk Driving (DUI), this is a solidly “middle of the road” Court, being neither especially lenient, nor overly harsh. On the other hand, the 41B District Court tops them all in terms of being expensive. Fines and Costs here are always on the high end. No one gets out of this Court inexpensively. Given that it’s not a particularly “harsh” Court, and given the admirable level of consistency in that regard, I think it’s better to pay a little more and walk out the front door after a DUI, rather than get a great deal on the Fines and Costs, along with some time in Jail to savor that bargain. As a DUI Attorney, I am lucky to have the 41B District Court as my “home” Court. I’m often in this Court 3 times a week, so my observations about it are based upon considerable experience. Frankly, if a person is unlucky enough to get a Drunk Driving, having the case land here is at least a decent break. Judge Sebastian Lucido worked in Private Practice, like me, before being appointed to the Bench. Quick-witted and very intelligent, his natural disposition is overwhelmingly kind, and it is obvious to anyone paying attention that he tries very hard, and is uniformly successful at being fair. He is quick to give someone a break. This is a bonus for anyone facing a DUI. In 1st Offense DUI cases, he is always open to the possibility that a person has simply fallen victim to a lapse in good judgment. In Second Offense DUI Cases, he won’t buy that excuse (nor will any Judge, for that matter), but he is similarly receptive to working with someone who is ready to address their problem and take care of getting themselves on the straight and narrow. This means that if the right steps are taken, Jail can be avoided. Judge Linda Davis was a Macomb County Prosecutor before being appointed to the Bench. She was, in that role, always firm, but fair. Her appointment to the Bench was made at a time when the 41B District Court had been having problems. She came in to clean things up, and beyond doing that in short order, she was able to transform the Court into one of, if not the most efficient Courts in the County. Perhaps her biggest attribute is that solid sense of fairness. She is tough, and not in the sense that she is harsh, but rather that she will tell it like it is. She has the ability to assess a situation involving alcohol or drugs, quicker and more accurately than any other Judge around, She will accept no BS, and if presented with it, will call the person on it. Her raw intelligence would make her an ideal candidate for any important position at a national level. It takes some work, but even in 2nd Offense DUI cases, a person can walk out the front door of her Courtroom, and not be taken away through the back. New Judge Carrie Fuca begins her term on January 1, 2011. A veteran private Attorney who also worked as an Assistant Prosecutor in this Court, it is expected that she will do well as a Judge. Having represented people facing DUI’s, it is likely she will remember the principal role of the Defense Lawyer: To make things better for the Client. I look forward to coming back to this article an updating it once she settles into her new role. Having known her in the private sector, and barring any sudden closed-head injuries, she will undoubtedly fit in well with Judges Lucido and Davis, and will mirror their approach to handling DUI Defendants. In my Practice, I have probably handled thousands of 1st Offense, 2nd Offense and even 3rd Offense (Felony) DUI cases in the 41B District Court. I know this Court well, and can assure anyone who has a case there that, beyond paying a lot for their mistake, they can emerge from this Court in much better shape than they can probably imagine. This is a fair, but very firm Court. When I use the term “middle of the road,” I mean that precisely in the rather unspecific way it sounds. This Court treats DUI cases seriously, but not meanly. It is a Court of intelligence. DUI cases can be worked out here, and most 1st Offense cases can be, with the right work, reduced from the more severe OWI to the less severe Impaired Driving charge. 2nd Offenders can be kept out of Jail, if they make the right decisions before walking into Court. The 41B District Court has its own in-house Probation Department. Like the Court, the Probation Department is solidly “middle of the road” in terms of being strict. More proactive than reactive, typical Probationary conditions in DUI cases involve classes, counseling, and testing. While my role in helping Clients essentially prohibits me from being overly critical of the Judges before whom I practice, anyone who facing a DUI, when all is said and done, will ultimately agree with my assessment of the 41B District Court. I genuinely like Practicing in this Court, primarily because I feel I can help my Clients out a great deal here. And this really is a final note that applies to all of the articles in this series: If the Lawyer you hire has a “problem” with the Judge to whom your case has been assigned, or has had run-ins with that Judge, do you really think it’s going to help your case? Your Lawyer is like your Ambassador. A good diplomat persuades the other side. A moron argues the other side into a corner. He or she may win that one argument, but always remember the old saying about “paybacks.” Whatever else, you don’t want to be standing next to and represented by a Lawyer that your Judge doesn’t like. Knowing this Court as well as I do, I can help my Client avoid things that will only test the Judge’s patience, and can instead lead him or her in a better direction based upon my extensive contact with these Judges. I know what works, and what doesn’t in this Court. Beyond that, I can usually tell the Client exactly what is going to happen, right down to the letter. Final Verdict: Not too strict, but not overly lenient, very expensive, and very efficient.